Safecrack is our most popular promotion. Wherever and whatever your promotion our Safecrack will delight. Contestants enter a code into the panel of our proprietary plexiglass safe. Open the safe door and they win the displayed high-value prize. You promote the chance for entrants to win up to $1,000,000. You include a version of the prize in the Perspex safe – car keys, property title, gold bullion or replica car/boat/plane. Your contestants try to crack the code, if the safe opens they win the prize. Where it’s insured, we pay! Safecrack probabilities are determined by you based on your budget. You can have a probability ranging from 1/10 (one in ten) to one in 100 million. Prizetech can help you develop your Safecrack promotions – it can be hosted in one venue or dozens of different venues. Such an exciting promotion, no wonder it’s so popular. You work out what prize/s you want to give away, low to high value. And you decide how many or how few prizes you want to offer (we vary the probability to match this). You even decide the duration, our spectacular smart safes know how many entrants, the frequency and the winners so you can really analyse each aspect of your promotion. 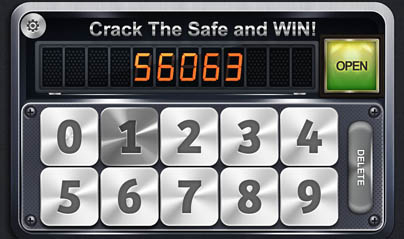 And you determine the prize frequency as you can choose the most appropriate probability of the Safecrack; from lots of prizes (one in ten, used for frequent low cost prizes) to really high probability (12 digit safecrack) or anything in between. Both versions of our Safecrack Promotions have access to our 24/7 help line if needed. 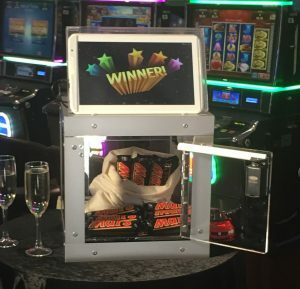 Safecrack prizes can be almost anything from your products samples to life changing prizes like a house or a million dollars!